EAST HARTFORD, CT – BioSafe Systems is pleased to announce the hire of Brittney Vail as their new Administrative Assistant. Based out of the Connecticut headquarters, Brittney’s main task will be assisting customers with questions regarding the company, their products, and ensuring all requests are handled by the appropriate departments. In addition to helping oversee day-to-day tasks, Brittney will be responsible for the content on the company’s commercial and retail sites. Brittney graduated from the University of Hartford in 2015 with a degree in English Literature and a minor in Professional & Rhetoric Writing. Prior to joining BioSafe Systems, she held several internships with marketing and publishing companies where she edited articles and even published some of her own work. Her strong background in professional writing and customer service makes her an ideal addition. EAST HARTFORD, CT – BioSafe Systems is proud to welcome Jeffrey Madewell to the Meat, Poultry, and Seafood (MPS) team as Technical Manager. Working in Fayetteville, AR Jeff will be responsible for assisting the MPS and Animal Health team in developing a ‘Farm to Table’ strategy and offering support for corporate sales initiatives. Jeff’s focus will be on aiding BioSafe’s Technical Service team with the coordination of routine service visits and managing details for the installation of on-site equipment. Holding a degree Hospitality Administration from Arkansas Technical University, Jeff comes to us with a versatile background within the food safety sales and hospitality industries. Most recently Jeff worked with Zep, Inc. where he spent the last seven years supplying sanitation, chemical, and maintenance solutions to food manufacturers. EAST HARTFORD, Connecticut – BioSafe will be exhibiting at The Poultry Federation’s Live Production Symposium on August 1-2, 2017 in Rogers, Arkansas. The booth will be manned by seasoned staff Technical Sales Representative, Michael Applewhite and Regional Sales Manager, Dean Allen. As experts in their fields these two know all the ins and outs of the animal health market. Implement these techniques to make the most of your pest monitoring program. Monitoring or scouting is an important practice associated with any plant protection program in greenhouse production systems. Careful inspection will help to assess the population dynamics (relationship between populations and the environment) and trends throughout the growing season. This article describes seven strategies that should be implemented in order to ensure the success of a pest monitoring program. Place colored (yellow or blue) sticky cards among crops as soon as possible in the spring and conduct visual inspections, which will help to avoid outbreaks of insect or mite pest populations from occurring. Be sure to check the sticky cards once per week, count the numbers of insect pests and record the number detected on sticky cards and plants. 2. Position colored sticky cards appropriately. In order to capture adult thrips (western flower thrips), whiteflies, shore flies and leafminers, place sticky cards just above the crop canopy, and attach to a bamboo stake with a clothespin, thus allowing the sticky card to be adjusted as the crop increases in height (size). However, in order to effectively capture adult fungus gnats, position yellow sticky cards horizontally near the growing medium surface, as this is where adults are most active (flying around). In addition, yellow sticky cards can be placed on the rims of containers and flats. One side of a sticky card can be utilized for one week, leaving the waxy protective paper on the unused side of the sticky card for the second week, which allows for one sticky card to be used for two weeks. 3. Place sticky cards underneath benches with soil-based or gravel flooring. Position yellow or blue sticky cards, or yellow sticky tape underneath benches to help capture and detect the presence of adult thrips, fungus gnats and shore flies, which will aid in determining if these insect pests are, or have pupated in the gravel or soil. Sticky cards (yellow or blue) will capture adult thrips (western flower thrips), whiteflies, fungus gnats, shore flies, and leafminers. However, mealybugs, scales, and spider mites, as well as, eggs, larvae, nymphs and pupae will not be captured on sticky cards. Therefore, it is important to check plant parts (e.g. leaves and stems) during routine monitoring to determine the presence of non-flying insects and various life stages (eggs, larvae, nymphs and pupae). 5. Check the undersides of leaves. Nearly all insect and mite pests and life stages are located on leaf undersides, so be sure to regularly check the undersides of leaves to detect the presence of non-winged aphids, mealybugs, scales and spider mites, as well as the eggs, larvae, nymphs and pupae of thrips, whiteflies and leafminers. Always maintain records of your monitoring efforts by collecting information on 1) all major insect and/or mite pest problems during the growing season; 2) susceptible crops; and 3) location in the greenhouse — especially those areas near openings such as, doors, sidewalls and vents. Place sticky cards and visually inspect plants near openings so as to detect the adult stages of insect pests, including: winged aphids, thrips, whiteflies and leafminers that may disperse inside from weeds, fields and/or vegetable crops growing nearby. Maintaining records will be helpful in allowing you to assess when and where localized infestations or “hot spots” of insect and/or mite pests occur within the greenhouse. 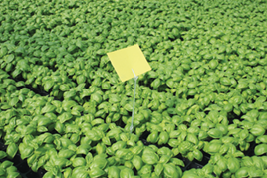 By placing sticky cards in your greenhouse early on, you can avoid outbreaks of pest populations. 7. Remove yellow sticky cards before releasing natural enemies. 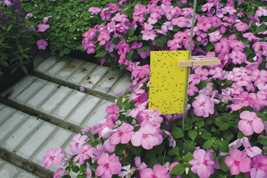 Prior to releasing natural enemies such as parasitoids and/or predators, remove all yellow sticky cards as the adults of many parasitoids and predators are attracted to yellow and will subsequently be captured. In conclusion, monitoring is an important plant protection strategy that will help alleviate insect and/or mite pest outbreaks from occurring during the growing season, and also enhance the effectiveness of timing insecticide applications and releases of natural enemies. Position colored sticky cards appropriately. Place sticky cards underneath benches with soil-based or gravel flooring. Check the underside of leaves. Remove yellow sticky cards before releasing natural enemies.